LOS ANGELES – Infusing original concepts and sounds into a powerful dichotomous fusion of Japanese guitar great Daita Ito’s edgy Japanese hard rock and the grounded intensity of its Western equivalent, Breaking Arrows (www.breakingarrows.com) brings its multicultural fire to Hollywood for two highly-anticipated September shows. The band, which includes powerhouse vocalist Nik Frost, bassist Francis Ten and drummer Brendan Buckley, is set to perform at 9 p.m. Saturday, Sept. 21 at Loaded (6377 Hollywood Blvd. ), followed by a 9:30 p.m. set Wednesday, Sept. 25 at Club Moscow (1652 N. Cherokee Ave.). 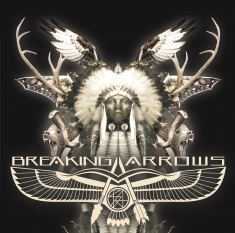 Breaking Arrows’ recently released self-titled debut album on AudioNest (licensed from Sony Music Japan International) was produced by multi-platinum songwriter/producer Marti Frederiksen, whose extensive credits range from pop/rock and hard rock to country. In addition to his work with Aerosmith, Gavin Rossdale, Carrie Underwood, Buckcherry, Daughtry, Ozzy Osbourne, Fuel and Def Leppard, Frederiksen co-wrote all 13 songs on Motley Crue’s 2008 release Saints of Los Angeles and has written or co-written songs with Mick Jagger, Jonny Lang, Scorpions, 3 Doors Down and Kenny Wayne Shepherd. In 2010, Ito came to the U.S.to meet with Frederiksen, whohad previously worked on an Americantribute album based on Ito’s popular rock band, Siam Shade. During his visit, Ito came across rising young vocalist Nik Frost,whose powerful voice and wide vocal range proved the perfect complement to Ito’s edgy, melodic riffs and pop sensibilities. In 2012, as Ito and Frost were developing their new heavy rock sound, they met Ten and Buckley,whose intense rhythmic pocket became the driving foundation of Breaking Arrows. Combining Ito, Frost and Fredriksen’s wealth of musical creativities, the band began recording a series of pummeling, catchy and riff heavy songs. The overwhelming initial response to Breaking Arrows led them to work with the rock oriented label AudioNest, which cultivated the band’s initial exposure to fans worldwide and ultimately led the high energy group to sign with Sony Music Japan International. Free cover before 10:30 p.m. with printed flyer (check on website) or $10 all night at the box office.